Monica Mazurek, a senior from Mt. Prospect, is the Elmhurst College 2017 recipient of the Abraham Lincoln Civic Engagement and Student Laureate Award. 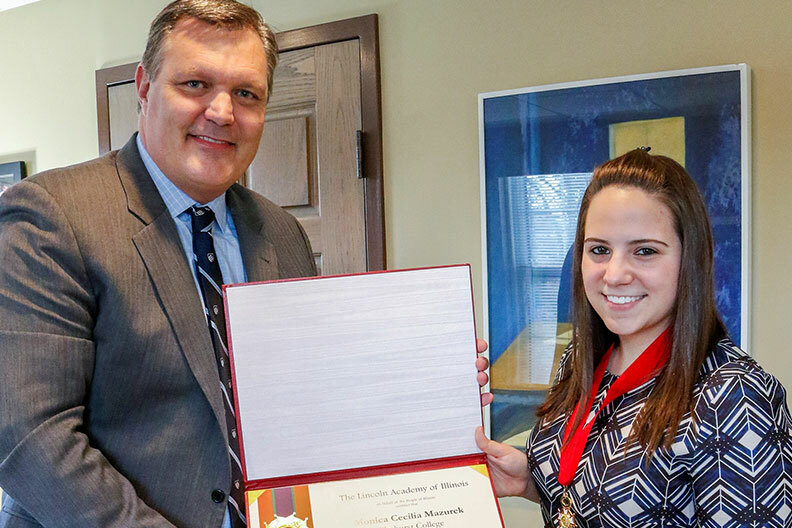 Elmhurst College President Troy D. VanAken presented the award to Mazurek, a psychology and intercultural studies major, on Dec. 14. “As a first-generation college student, I feel incredibly honored just having been nominated for this award,” Mazurek said. Every year, one outstanding senior from each of the four-year degree-granting institutions of higher learning in Illinois is awarded the Abraham Lincoln Civic Engagement Award and becomes a student laureate of The Lincoln Academy of Illinois. In the spirit of President Lincoln, student laureates are honored for their leadership and service in the pursuit of the betterment of humanity and for overall excellence in curricular and extracurricular activities. Each student laureate receives a $1,000 Abraham Lincoln Civic Engagement Award, a Lincoln Academy medallion and a certificate of honor. The Student Laureate Award ceremony is held at the Old State Capitol in Springfield, Illinois, but Mazurek received her award at the College because she was unable to attend the Springfield ceremony—she was presenting social psychology research at the National Collegiate Honors Council conference in Atlanta. She will use the award money to help pay for graduate school, where she plans to earn a master’s degree in industrial/organizational psychology. Each year, Omicron Delta Kappa, the Elmhurst College scholastic and leadership honor society, solicits nominations for outstanding seniors for the Abraham Lincoln Civic Engagement Award. In the nomination letter for Mazurek, Honors Program Director Mary Kay Mulvaney noted that Mazurek is a first-generation college student who transferred to Elmhurst after earning an associate’s degree and became an active member of the Honors Program. As an Honors Program student, Mazurek conducted extensive undergraduate research in psychology, studied overseas on scholarships, and now is applying for an ETA Fulbright in Thailand. She also gives back to the community through service and as a swim coach.